Group says, "Military families were not consulted nor their wishes honored"
WASHINGTON (CNN) -- The Pentagon will lift its ban on media coverage of the flag-draped coffins of war victims arriving at Dover Air Force Base in Delaware, Defense Secretary Robert Gates said Thursday. 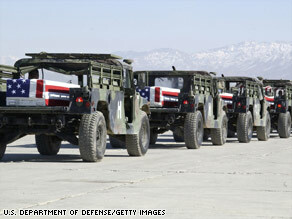 Military vehicles carry coffins containing U.S. troops in this photo the Pentagon released in 2005. But the families of the victims will have the final say on whether to allow the coverage, he said. President Obama asked Gates to review the policy, and Gates said he decided after consulting with the armed services and groups representing military families to apply the same policy that is used at Arlington National Cemetery. Gates said he had formed a group to create an implementation plan for the new policy. Advocates of opening the base to coverage point out that the unmarked coffins make it impossible to identify specific remains. A statement from the National Military Family Association said it "appreciates the sensitivity" of the secretary "and his recognition that individual families must play a part" in any decision about media coverage. "We look forward to the recommendations of the working group on the implementation of this policy," the group said. Not everyone had a positive reaction. "Military Families United is disappointed in the president's decision to overturn the ban that has been in place for over 18 years," the group said in a release. "Just last week, Families United released the results of a survey conducted among military families, which found that more than 64 percent ... believe that this ban should not be overturned. It is evident that military families were not consulted nor their wishes honored when the decision was made. "This is a complete disregard for the will of America's military families and their need for privacy during this solemn moment," the release said. After the Iraq War began, critics of the George W. Bush administration accused it of disallowing photographs and filming to de-emphasize the number of casualties from what many considered an unpopular war. Although the Defense Department won't confirm it, it is widely accepted that the idea for the ban began after the December 1989 U.S. invasion of Panama, when the United States deposed dictator Manuel Noriega. After a news conference held by President George H.W. Bush, his press secretary made a humorous remark, which caused the president and reporters to laugh. At the same time, viewers were watching coffins of the first casualties from the invasion being unloaded at Dover. The following year, when the Persian Gulf War began, the Pentagon banned media coverage of war dead being returned to the base. One of the family members who favors lifting the ban is Karen Meredith of San Francisco, California, who wrote Obama urging him to order the change. Lt. Ken Ballard left for Iraq on Mother's Day 2003. He came home in a casket on Memorial Day 2004. "I wanted the nation to grieve with me, and if we don't see those images we don't know that these young men and women are dying," she said. "And to me it's an honor to have an honor guard at Dover when they're bringing these men and women back through the mortuary. But we've never been able to see those pictures of the honor being given." Others say the honor should remain private. "When they come off the plane these are anonymous caskets. What is the greater good of that?" asked Vince Rangel, who was an Army Ranger captain in Vietnam. "I would rather take that attention and give it everything it deserves at the grave site in the communities where you can get all that information, so people can understand these people as human beings. Not just as a flag-draped casket that comes out of a plane." Pentagon spokesman Geoff Morrell said about two weeks ago that a good deal of input needed to be collected from a number of sources, including Pentagon offices representing family interests, the Defense Department's public affairs office and the various service branches. CNN's Barbara Starr and Susan Roesgen contributed to this report.